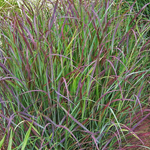 Purple fountain grass is an absolute classic for fall landscapes and containers. But did you know that it has two variegated siblings? ‘Fireworks’ is a pinky-red variegated sport with a fiery glow. It is a bit more restrained than the species and bears the same showy purple plumes. 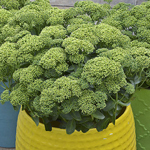 ‘Sky Rocket’ is a vigorous green and white variegated sport with light purple plumes. All three last long into fall, providing winter interest and food for birds until the heavy snow falls. Nemesias are classic annuals for fall plantings as they are exceptionally cold tolerant. 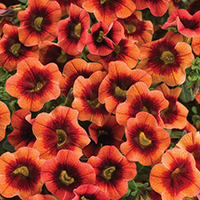 Their warm toned, plentiful blooms make them ideal for fall-themed baskets, containers, and in-ground plantings. The star of the series is Sunsatia Blood Orange. Its fiery red-orange blossoms appear right up until frost. 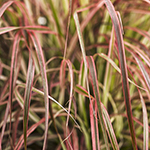 You’ll often find Toffee Twist Carex included in combination containers for fall because its wispy, copper colored foliage is an ideal complement for rich reds, purples and golds. Its upright fountain-like habit provides an interesting textural contrast to mounding mums and fall bedding annuals. Used en masse or as a specimen, Toffee Twist will stand out wherever it is planted and will retain its visual interest right through winter. 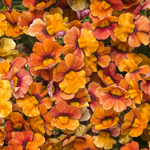 Thanks to breeders who are selecting for increased cold tolerance in Calibrachoa, they can now be included with confidence in both spring and fall combinations. Superbells are available in a staggering array of vibrant colors, many of which fit easily into the richer, earthy toned combinations that are popular in the cooler fall months. Their trailing habit makes them ideal candidates as spillers in hanging baskets and upright containers. If you are looking for a more high-end option for window boxes, deck planters and landscapes, try a mix of fall-toned coral bells. They pair very well with ornamental grasses and have the added advantage of being perennial in zones 4-9. 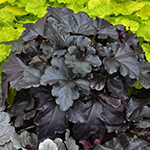 Coral bells are versatile plants for sun or shade that provide year-round interest with their evergreen to semi-evergreen foliage. If you are looking for perennial grasses that will grow and mature over many years to come, try our Prairie Winds series. 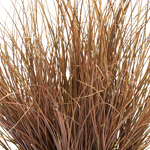 This group of perennial grasses includes manageable 3-6’ tall varieties that bloom in late summer to early fall and develop attractive fall color. They all need full sun to thrive and are deer resistant. Bees, butterflies and gardeners delight in the late summer and fall flowers of sedums. They are a breeze to grow in full sun and aren’t too choosy about sandy or clay soils. This year, try something different than the standard ‘Autumn Joy’ types. All of the Rock ‘n Grow Sedums offer something unique, from the citron yellow flowers of the upright ‘Lemonjade’ to the groundcover habit of 'Superstar'. All are hardy in zones 3-9. Viburnums are essential flowering shrubs for foundation plantings, living screens and the back of the border. Brandywine has one of the most beautiful fruit displays of all viburnums, developing large clusters of pink, blue and ivory berries in fall. Its glossy, dark green foliage turns maroon red in fall, too. 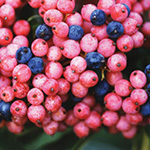 This variety will fruit without a pollinator, but you'll have more berries if you plant it near another Viburnum nudum type like 'Winterthur'. Hardy in zones 5-9. 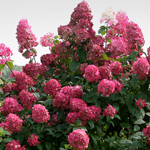 Why are panicle hydrangeas so popular with today’s gardeners? Because they are one of the easiest types of hydrangeas to grow, bloom reliably every year, and aren’t fussy about soil pH. Dwarf cultivars are excellent in containers while larger specimens are showoffs in the landscape when used as focal points and hedges. Each cultivar offers something special, from the pomegranate pink flowers of Fire Light to the outstanding bloom power of ‘Limelight’ and the crowd favorite Pinky Winky which never disappoints with its huge, two-toned plumes. All are hardy in zones 3-9. Though they are attractive shrubs in the spring and summer landscape, it’s what happens in late fall and winter that really counts for Winterberries. Berry Heavy bears dense masses of extra large, shiny red berries that persist long after its leaves have fallen. Berry Heavy Gold is equally attractive with bright gold fruits. Winterberry will create visual impact wherever it is planted, but it is especially striking when planted en masse. 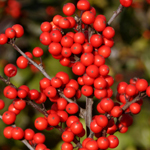 The Berry Heavy series grows 6-8’ tall and is hardy in zones 3-8.